Rich is 62 years old and was born on the Eastern Shore of Maryland in 1947. He attended high school in Caroline County and in 1965 enrolled at Franklin and Marshall College . Rich graduated in 1969 with a B.A. in Government. He taught in Baltimore City Public Schools for one year before beginning a six-year tenure at Glenelg Country School in Glenelg, MD. In the fall of 1976 he began a 31-year career with the Howard County Public School System, teaching at Patapsco Middle School for four years, and Hammond High School for twenty-seven years, starting out as a mathematics teacher and later as a computer science instructor. In that time he received two Masters degrees from Johns Hopkins University---one a Masters in Administration, and the other a Masters of Science in Technology Education. In addition he completed ten courses in Accounting at the University of Maryland University College, almost leaving teaching in 1980 to take the CPA exam. His wife jokingly called him a "professional student"! Rich retired from teaching in 2007 after a 38-year career, almost all in Howard County. While planning for his 2010 political race, he states that if every student he has taught in the county would give $5.00 to his campaign, he would not have to raise money from anyone else! Rich has been married to his wife Maryann for 31-years and has two grown children---Christine, age 26 and Michael age 23. When his kids were growing up he coached many sports teams in Howard County and Columbia---soccer, basketball, baseball, softball and lacrosse. He was a member of the PTA Council of Worthington Elementary during their elementary school years and served one year as vice-president and one year as PTA president. Rich is currently the president of the Brampton Hills Community Association where he has lived for twenty-five years and is a member of the GlenMar United Methodist Church in Ellicott City. In retirement Rich has joined county civic organizations, including the League of Women Voters, the Glenwood Lions Club, the Howard County Farm Bureau and the Sierra Club. He is a life member of the Howard County Education Association, the Maryland State Education Association, and the National Education Association. 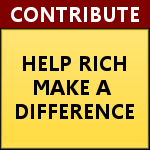 During the 2009 General Assembly session in Annapolis, Rich worked as an intern for Delegate Steve DeBoy of District 12A(mostly Baltimore County, but also the Elkridge area of Howard County).